This remarkable image is an illustration of Union Square viewed from the corner of West Lombard Street and South Stricker Street as it appeared in 1866. Note the fence with gates around the park, the pavilion (1847) to the right, and Willow Brook mansion (1799) in distance at left. By 1866, the South Stricker Street and West Lombard Street sides of the square were fully developed - the homes on the Hollins Street side of the square were just beginning to be constructed and were completed around 1870. 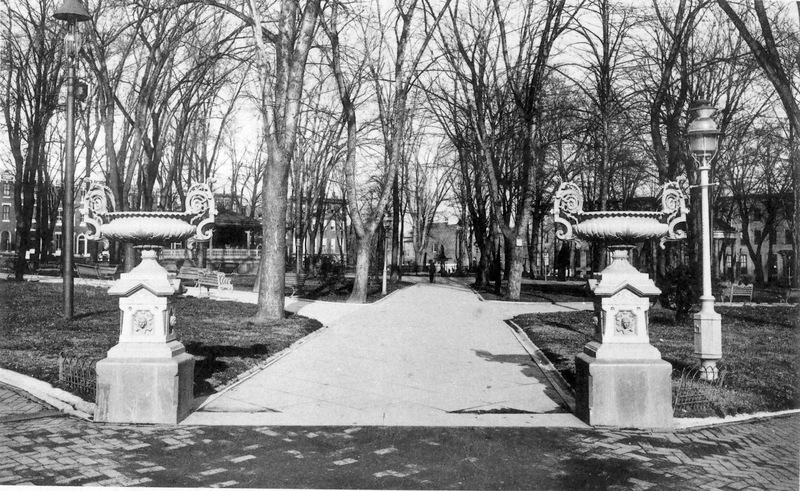 Looking closely through the open gate, it appears as if there is a matching arch with a closed gate diagonally across the park in the distant background - at the corner of Hollins and Gilmor streets. At the far right of the image, there's another arch which (in perspective) would be at the corner of Stricker and Hollins streets. For the sake of symmetry - a favored aesthetic at the time - it would make sense that the four corners had matching gates and, of course, the current entrances continue that aesthetic. From this illustration, it's hard to discern what sort of entrance there was at center of each side on the square but one would have to assume that something was there in the vicinity of the pedestrians shown standing at the right side on Stricker Street. Based on the height of the men, the fence appears to have been over 6 feet tall (plus the height of the spikes) while the entrance arches appear to be about 12 feet tall. 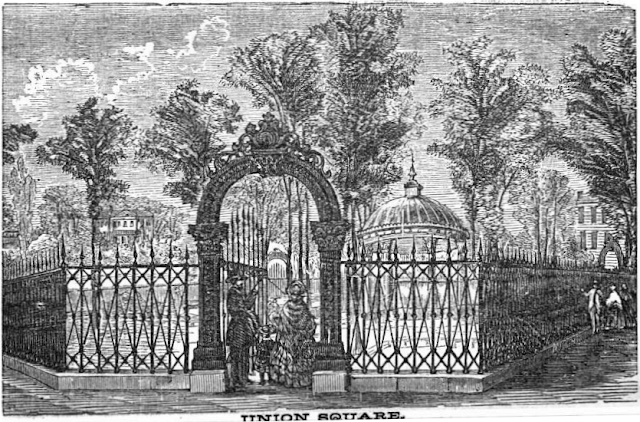 A special attraction of Union Square was a spring of fine water, so abundant that in 1849 the Baltimore & Ohio railroad paid the city $4,000 for the privilege of piping its surplus water to Camden station. The remaining (non-functional) elements of this piping still exist beneath a covered opening under the pavilion. Willow Brook (1799) became the Donnell Mansion (1810) which became the House of the Good Shepherd (1864) which underwent many transformations and which was razed in 1965 to eventually become Steuart Hill Elementary (1966). At the time of this illustration (1866), Mrs. Emily McTavish (who inherited the Donnell Mansion) had already donated the mansion to the Sisters of the Good Shepherd (1844) who opened it as the House of the Good Shepherd (1864). Its purpose was to reclaim and reform fallen and unfortunate young girls and children in danger of being led to ruin. It is one of the great institutions founded by the Roman Catholic Church that left an impression upon the community's life. It was used by the courts for the purpose of committing and incarcerating "incorrigible and vicious white females under the age of eighteen years." The cornerstone of the House of the Good Shepherd's first addition (including a chapel and a 20-foot tall stone perimeter wall) was laid July 10, 1886. It is understood that the high stone wall - topped with broken glass - went completely across the park side of the property on Gilmor Street and completely across the Lombard Street and Hollins Street sides of the block - and the entrance gate in the wall opened toward what had been the rear so that, in later years, locals may have thought of it as a Mount Street institution. There is still speculation regarding the height and configuration of this wall and whether it was a solid expanse of stone blocks or if there were any narrow windows, buttresses, turrets, or other ornamentation along the wall. As additional images are located, the information will be shared via this website. In his writings almost a century after the time of this illustration, H. L. Mencken commented that he caught fleeting glimpses over the stone wall from the third floor window of his home on Hollins Street. From this vantage point, he could occasionally see the nuns in their traditional black habits bustling around the grounds of the House of the Good Shepherd. A new hand book, containing Sketches of the Early History and Present Condition of Baltimore, with a Description of its Notable Localities, and other Information useful to both Citizens and Strangers. Note: In 1875, the fence around Union Square Park (as well as Franklin Square and other city squares) was removed in accordance with a Baltimore City ordinance. In place of the fence, pediments with flowering urns were located at the entrances to the square. This photo of Union Square was taken from the corner of South Gilmor and West Lombard streets. The actual date of this image would be after the square's fence was removed in 1875 so it may be from the early 1900s. The pavilion is to the right and the fountain is in the center, but the building with porch rails to the left is a mystery. Currently, a small park utility building is in that location. Like those fabulous urns in this old photo, the original building appears to be much larger and more elaborate than the current replacements. 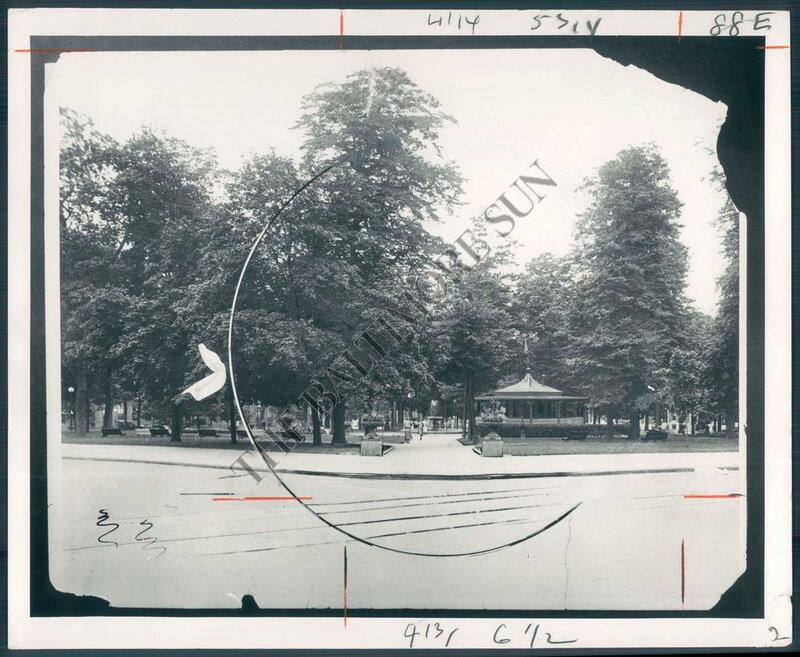 This photo from The Baltimore Sun archive is dated 1924 and shows the park from the corner of South Gilmor and Hollins Streets. Note again the fabulous urns at the park entrance and a better view of the elaborate building that has been replaced with a small park utility building that is there today.